The PRWeek team has been busy dissecting and analyzing the performance of 68 PR agencies. Global strategies, fueled by compelling content and integrated offerings helped agencies successfully navigate a tricky 2013. Vast opportunities for PR firms in hot and emerging markets outweigh the challenges that come with worldwide expansion. The average revenue growth of the agencies that submitted figures for PRWeek's Agency Business Report was up slightly. *Figures formally submitted to PRWeek for agency rankings. Other figures are PRWeek estimates for 2013. The PRWeek Agency Business Report is produced annually. It includes profiles of PR firms and agency rankings, which are determined by the companies’ annual PR revenues. In 2015, for the first time, PRWeek is truly globalizing its Agency Business Report. PRWeek will profile selected firms online and in the May 2015 US and UK print issues. 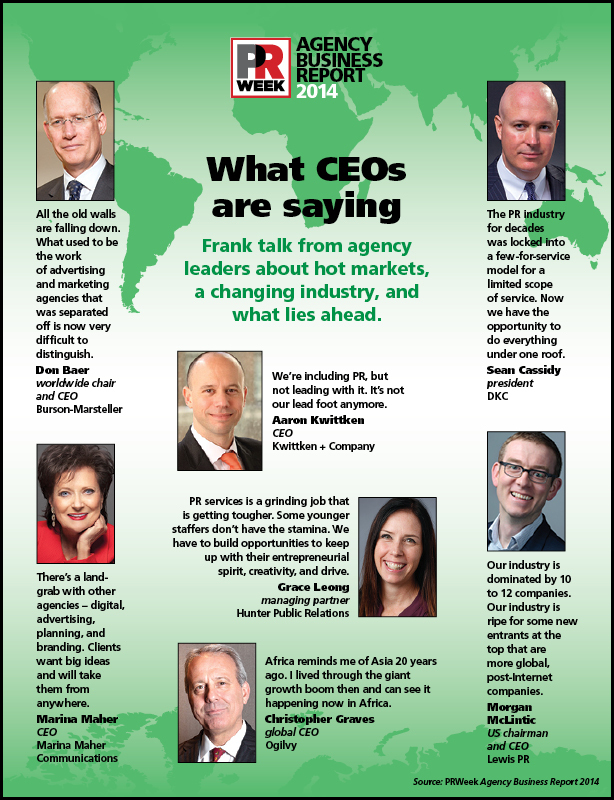 Click here to submit your agency, or email questions to abr@prweek.com.